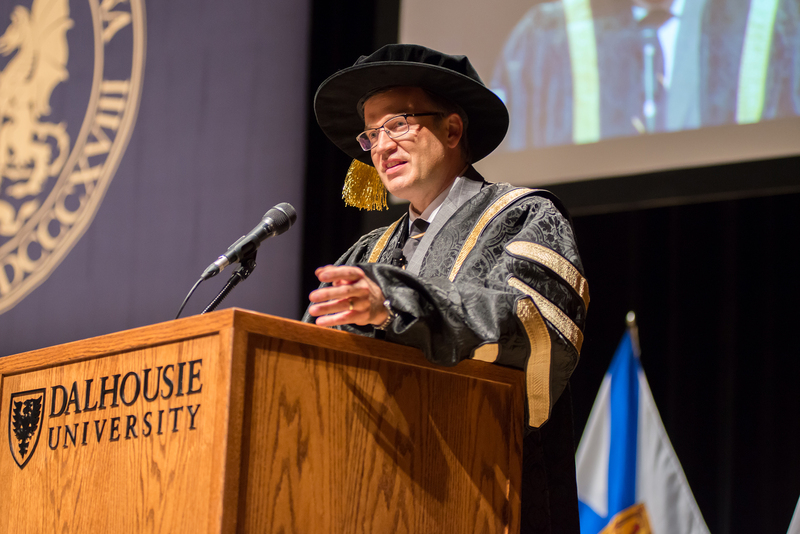 On the occasion of Dalhousie University formally installing only the 11th president in its history, the man now tasked with leading it told the crowd that cultivating business and international partnerships are critical to the institution’s success. Richard Florizone shared his optimism for Dal—along with the challenges still to come—during a 22 minute address Oct. 4 at the Rebecca Cohn Auditorium to a crowd of over 200 people. Florizone spoke about the Dalhousie of the future, reminding his audience that we cannot do anything alone. “Without public support, without students, without donors, without researchers and scholarly collaboration, at home or around the world, Dalhousie would simply fail to exist,” Florizone warned. To survive, Atlantic Canada’s largest university must strengthen and build upon its existing partnerships at a time of strained public finances, but Florizone is convinced Dal has what it takes. Florizone officially became president on July 2, following a month spent shadowing former president Tom Traves, who held the position for 18 years. The outgoing president sat beside his replacement during the afternoon ceremony. Traves said in his speech that he quickly understood why the presidential search committee unanimously selected Florizone to succeed him. Florizone comes to Dal as an accomplished senior administrator, aware of the challenges of reducing costs at a growing university, a situation akin to his stint as the University of Saskatchewan’s vice-president of finance and resources. Florizone was on administrative leave for a year before coming to Dal to work for the World Bank, advising the New York-based organization on public-private partnerships. He holds a bachelor’s in engineering and a master’s in physics at the University of Saskatchewan and a PhD in physics from MIT. Earlier in the day, Dal’s president hosted a panel discussion with eight university leaders from around the world to share advice on how to manage today’s post-secondary institutions. Those administrators, presidents, former presidents and chancellors were also presented with honourary degrees from Dal. “Your presence here speaks to the importance of global partnership and Dal’s increasing role on the international stage,” Florizone told his guests. Florizone said that increasing the diversity of ideas and people on campus is key to continued growth. He referenced the university’s origin when claiming that diversity has always been a part of Dal’s DNA. With Lord Dalhousie’s insistence, Dal became the first non-denominational university in North America. Florizone said that Dal can do more to make its four campuses more welcoming. “For the Atlantic region to grow and prosper, we need to open our doors to the world. Dalhousie should serve both as an example and a leader in diversity and as a place where the world comes together,” he said, drawing applause. About 12 per cent of Dal’s over 18,000 students hail from 112 different countries.